This lesson DVD (about 67 minutes) understandably demonstrates several basic and execution techniques and variations from Kukishinden Ryu Yoroi Kumiuchi, the fight techniques of the Samurai in a suit of armor (Yoroi). Here are demonstrated the specifics of the fight positions in reference to balance, stability and safety also important differences to Taijutsu without a suit of armor (of example movement type and movement rhythm by wearing a suit of armor). All techniques (katas) are explained step by step, then demonstrated in normal speed and slow motion. The several katas are first demonstrated as Taijutsu-Versions and then as Budo-Taijutsu-weapon-techniques also demonstrated in a real suit of armor as an interesting enrichment for the Taijutsu training and training with weapons. 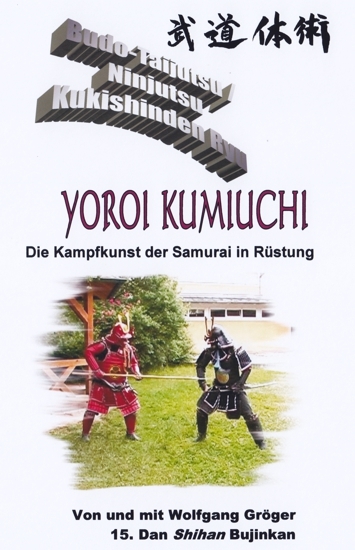 This DVD-video is a session record with graduate engineer Wolfgang Gröger Shihan 15th Dan (Menkyo Kaiden Kugyo Happo Hiken) Bujinkan Budo-Taijutsu (Bujinkan) and 12th Dan Goshin-Taijutsu (IAWO). Wolfgang Gröger is one of the first in Germany to study and teach Ninjutsu / Budo-Taijutsu. Thus he is one of the pioneers in the art of Ninjutsu / Budo-Taijutsu in Germany. Content: Kamae, Seion, Tenchi, Hosetsu, Torao, Onikudaki, Yume Makura, Ryubuse, Shiho Dori, Uchi Harai und Kassen Kumiuchi.